After years of owning but not reading Jane Eyre, I'm finally taking the plunge. Like the good little blogger I am, I've managed to (somehow!) find 15 fellow bloggers and reviewers to read it along with me. So, here goes nothing! First things first, it's not too late to sign up. New readers, re-readers, Classics Club members, non-CC members... the more the merrier. September 2nd: Kick-off post, introductions, why you're reading, etc. In my edition (the Penguin Classics Deluxe paperback), that works out to about 110 pages per week. We can so do this. Since there are some of us who haven't read the novel yet, please try to avoid spoilers past the section we're talking about each week. Since there are so many new and new-to-me bloggers participating in this event, I'm hoping we can kick off with a little introduction -- who are you, where can we find you on the interwebs, why are you reading (or re-reading) Jane Eyre? I'm all over social media myself, but of late, am most active on Twitter (@ofabookworm) and Tumblr (ofabookworm.tumblr.com). I'll be tweeting my reading with the hashtag #SeptembEyre. I've owned Jane Eyre for years, and when my husband and I merged our book collections, we realized that we owned no less than four different editions of the novel--despite the fact that I've never read it and he hates the book. I decided to finally read it after approximately 1.2 million people on the Twitter were horrified that I hadn't read it, and told me all the reasons I should. It's also one of the books on my Classics Club list, so I consider this one of those multiple-birds-one-stone situations. Besides some vague rumors (something about a man named Rochester, and someone living in an attic, I think? ), I actually know very little about the book, so I'm hoping to go in with an open mind and see what all the fuss is about. If you're participating, link up to your intro post here, and happy reading! Aw, I wish I could join up, I'm honestly curious what I would think of it now. I LOVED it when I read it in high school, but I don't know how my opinions might have changed. October books and several chunksters staring me down! I'll definitely be following along and seeing everyone's reactions, though! I've never read it, so this should be interesting. So excited! Books are all still in boxes, so I haven't cracked the spine yet, but I will soon. Picture me tearing through boxes to get to my copy. Heh. Good luck finding it! Unpacking is the WORST. Actually, no, packing is. But unpacking isn't great either. I'm so attached to that book! You will love it! I have been most excited for this day to come!! Last month I was celebrating Ms. Jane Austen, and this month I get to get a proper appreciation for Ms. Charlotte Bronte!! Eek. Wicked sweet! I am about to visit everyone's blogs, stay tuned!! 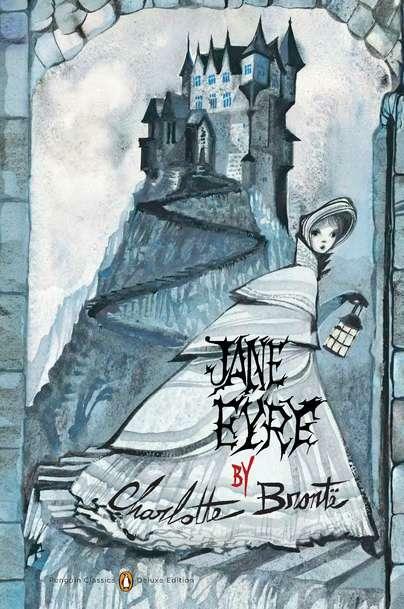 I am going to begin reading Jane Eyre today!! *NOTE* Kerry if this posts, I worked out the issue afterall! Sorry I didn't see your email yesterday, but glad you got the commenting to work! Yay it's Septemb-Eyre! (I might refer to this month exclusively that way. :D) I think I'm going to have the most fun reading the reactions of first timers to the story! Thank you for hosting this event Kerry! I am so glad I'm not the only one who isn't sure what it's about! Usually I don't like that, but I've started reading and I'm kind of glad I'm discovering it all as I go! Exactly. I actually like going into books relatively blind, but I find it's rather hard to do with classics. 100 pages in as of last night and freakin' loving it. Since I'm moving through it so quickly I'll be jotting down my thoughts about it along the way and so I'll have those ready to go (with no spoilers) as the time comes. Gonna post an intro/kickoff tomorrow. You are on a roll! And happy to host. I'm happy to have so many people to read it along with me, since it's been on my list for EVER already. What a great read-along! I participated in a Villette read-along with Beth (Too Fond) and Jaclyn (Covered in Flour), and it was a lot of fun. I think my September is probably too busy to commit to this read-along, but I'm looking forward to reading the posts and commenting. I re-read Jane Eyre in February when I read Margot Livesey's re-telling of it, The Flight of Gemma Hardy (which I didn't love). Glad you can follow along, at least. I didn't realize The Flight of Gemma Hardy was a re-telling of JE, but I'll have to check that out once I've finished the original. So many books and all that. I haven't been having any issues but then, I'm a Blogger user so maybe that's why. I don't blame you for not wanting to post as Anonymous, though! I've never seen a Blogger platform without the Name/URL option... maybe it's just a glitch? Yes, the problem is that I'm not a Blogger user. I've come across Blogger blogs with and without the Name/URL option, so I don't think it's a glitch. It sure would be nice if we had one uniform way of identifying commenters!